My hopes of a return to the cosmic glory days of Abnett and Lanning may be short lived as Marvel Comics has begun teasing the roster for the new Guardians of the Galaxy team. And it includes Cosmic Ghost Rider, who has to be one of the worse characters ever put together. The good news is that the new Guardians of the Galaxy team features Moondragon, Beta Ray Bill and Gladiator, with the latter two characters once being a part of the Galaxy's Mightiest Heroes, The Annihilators. 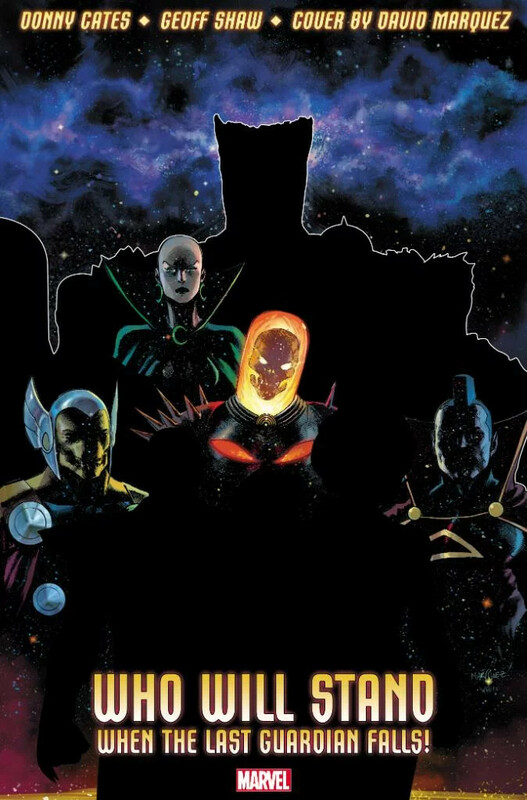 Taking a look at the other characters below, possible members may include Silver Surfer, Groot, Nova, maybe Darkhawk, and my wishful thinking favorite of Wendell Vaughn Quasar, but it is probably Adam Warlock. There also appears to be another female character inbetween Cosmic Ghost Rider and Gladiator. Any guesses? Marvel previously teased a bunch of the characters here. The new Guardians of the Galaxy debuts January 2019 from writer Donny Cates and artist Geoff Shaw. The teaser pics offers, "Who will stand when the last Guardians falls!"